This beautiful Club Cottage home is in excellent condition and located in the prestigious gated community of PGA National. This lovely 1,135 square foot home boasts two bedrooms, two bathrooms, a deluxe kitchen with breakfast bar, separate dining room and comfortable living room plus a large, private outdoor patio. All this in a lovely landscaped setting and manicured lawn with patio furnishings and charcoal grill for your favorite grilling recipes. Come relax and enjoy! Available for rental year-round on a monthly basis in season (Jan, Feb & March) and for less than one month in the off season months. There is an LA Fitness Club right around the corner within the community which is available for a fee. The home has an open floor plan with central air conditioning and heating throughout and comes fully furnished down to the last detail. Enjoy the lovely tree-lined landscape and the close proximity to public golf courses, a pool only for the Club Cottage Community and a world-class spa – all just within a five minute stroll! And, the beach is only 5 miles away! The large living room has an entertainment center complete with large flat panel TV, DVD and complimentary WiFi. You’ll find the modern sofas a welcome place to relax after a great day of golf or shopping! The two bedrooms are each furnished with two double beds adorned with cozy down-alternative duvets and pillow top mattresses. Both bedrooms have wall-to-wall carpeting, ample closet space (the master bedroom has a walk-in closet), large windows for bright, airy rooms. Each bedroom is appointed with a flat panel TV and has its own private full bathroom with tub/shower. In addition, hairdryers are supplied in the bathrooms for your convenience. All linens and towels are provided for the bedrooms and bathrooms. The kitchen is bright and fully equipped for gourmet cooking! You'll find all the necessary appliances supplied including coffee maker, electric juicer, toaster, blender, dishwasher and microwave. The stackable washer/dryer is located off the kitchen with an iron and ironing board for your convenience. The separate dining room seats four comfortably with room for more at the breakfast bar. Enjoy beautiful views from your large, private outdoor patio furnished with a patio table, chairs and umbrella for your enjoyment, as well as a charcoal grill complete with all the utensils you'll need for outdoor cooking. Parking for two cars (no trucks, vans or RVs allowed by community). This modern one story home is a delightful, modern and well-maintained vacation home conveniently located in PGA National. 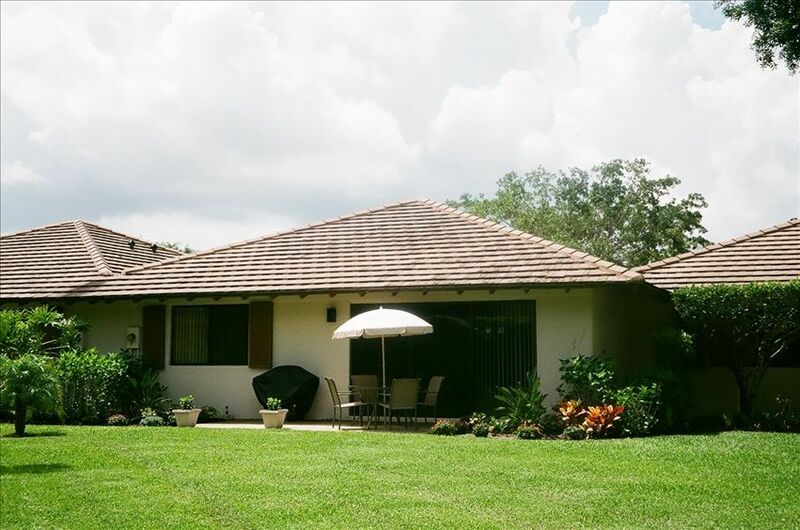 This cozy Club Cottage is only 15 minutes from the West Palm Beach Airport and the Palm Beach Outlet Mall. We are a few minutes from the heart of Palm Beach Gardens with its exclusive restaurants and shopping along with a cinema - and - you’re only five miles from the ocean and beaches of Jupiter and Juno! PGA National Golf Community is the home of the Honda Classic Golf Tournament. Your choice of public championship golf courses are in the area to enjoy. fishing, etc. just five miles away. there is a pool for exclusive by Club Cottage guests. -Life Fitness Center on-site for a fee. in town just minutes from the community. -Walking paths and/or bike trails in a gated community. -Downtown West Palm Beach is only 15 minutes away. Cardinals at Roger Dean Stadium just six miles away. -Worth Avenue (Palm Beach) shopping. Macy's, etc.) and Palm Beach Outlet Mall. Appointed with towels and hair dryer in each bathroom. We are 5 miles from the ocean and the beautiful beaches of Jupiter and Juno. Land line for local calls only. Down-alternative duvets, pillows with sheets and blankets. Parking available directly in front of unit - no RVs, trucks, pick up tracks or vans. 2 sets of towels (bath, hand, face) in each bathroom with additional, if needed. Beach towels also provided. There is an LA Fitness Center in the shopping plaza located within the community for a fee. It's approximately a mile from the property. Cozy sofa and loveseat with large TV, On Demand movies in living room (movie fees, if any, deducted from deposit), DVD player. Books, DVDs, board games, dominos and cards available for your enjoyment. Tea, coffee, sugar, powder coffee creamer & paper goods. Dishes, utensils, silverware, glassware, pots, pans, serving dishes, grilling utensils, etc. Service for 8 persons. Full kitchen complete with updated appliances, electrical appliances (Coffee maker, tea kettle, juicer, toaster), dishes, pots, pans, glassware and silverware, etc. Dining area seats 4 comfortably with room for 2 more at the breakfast bar. Flat panel TVs in the living room and in each bedroom. Cable TV provided in living room and in each bedroom. On Demand movies available on living room TV only (movie fees, if any deducted from deposit). There is a radio/CD player. DVD player in living room. A variety of books are available. Board games, dominos and cards available for your enjoyment. Lovely landscaped garden setting next to large patio area overlooking manicured lawn area. Complete with patio table, 4 chairs and umbrella situated in a lovely landscaped garden setting. Public tennis court access within 5 miles. Several public golf courses in the surounding area. A few minutes stroll around the corner from the condo is the pool for the use of Club Cottages only. Lovely property, clean and well maintained. This was our 6th year at this property. Love the location, property is well maintained inside and out, pool is close , good walking and biking trails. Excellent for families and friends get aways. Owner is ,readily accessible and responds promptly to concerns. We very much enjoyed our stay. Place extremely clean. Had all the bells and whistles. Would not think twice about staying there again. Clean, spacious, convenient to everything. Comfortable and secure location. The cottage was spacious and easily accommodated my family during the Thanksgiving holiday. We spent 2 months in this club cottage and loved it! It was the perfect place for us to relax after a day in the sun at baseball games in the area. The property owners were extremely accommodating and responsive to every question we had. They had recently remodeled both bathrooms which made our stay even more enjoyable. We also appreciated the gated security. The property is located near grocery shopping and both upscale or fast food restaurants like Bonefish Grill and Chipotle. This cottage was the perfect place to relax after a day in the sun watching baseball games in the area. We stayed here for 2 months and it was a wonderful experience. It is centrally located near restaurants like Bonefish Grill, or quick bites like Chipotle, and grocery shopping. The owners were exceptional and extremely responsive to our questions. They had recently remodeled both bathrooms at this property which was an added bonus for us. We also appreciated the gated security. We've been coming to the cottage for four years and each time it's been a wonderful stay. The owner is very responsive to any requests made, and continue to update the cottage to ensure the guests' comfort. Close to the pool but far enough away that we have privacy. Totally recommend it! Palm Beach Gardens shopping at the Gardens Mall (Macy’s, Bloomingdales, Nordstrom, Saks, etc.) with an array of restaurants and a cinema is only 5 minutes away. Palm Beach Outlet Mall and downtown West Palm Beach is just 15 minutes away. Spring training for the Florida Marlins and St. Louis Cardinals at Roger Dean Stadium is 6 miles away. Kravitz Center for the Performing Arts is 15 minutes away. Art galleries, City Place, Norton Art Museum, Worth Avenue (Palm Beach) shopping and Flagler Museum are also in the area. Rates are subject to change until reservation is confirmed. A security deposit is due with signed contract; deposit is refundable less damages, if any, 7 days after check out. HomeAway/vrbo credit card fees and PayPal fees are the responsibility of the guest.